When I need an idea, I go for a walk, a workout, or take a shower. Then the answers flow freely. It’s that simple. The end. Just kidding, of course. 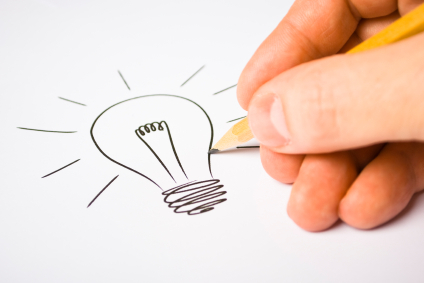 There’s so much more to generating ideas, but the steps are simple. Alas, you have to write the good ideas down quickly, otherwise, like slippery little fishes they can escape from your grasp, and the idea that was as good as gold is now gone like the wind. Of course, generating ideas is not as easy as just stepping into the shower every time you have a creative block. The hard work in idea generation is done long before this. It starts with being an expert in the field and that takes years of study. This is not what anyone likely wants to hear, but it’s true. If you’ve ever done a presentation as an amateur (say as a college student doing your first presentation on a given topic), you know how hard it is to find enough worthwhile things to say. But fast-forward five years later after you’ve finished your studies and developed some work experience in that same field, and you’ll find that you can now talk for hours – with ease – on that topic. It’s the same for generating ideas. The more you know, the more you’ve experienced, the easier it is to identify opportunities and solutions – to generate ideas. The next step in generating good ideas is to communicate about your topic as much as you can. That means giving more presentations, explaining your current ideas to others, writing about what you know now, and coaching others in your areas of expertise. I find that the more I do this, the more the new ideas come to me. You don’t want to hold back and keep your current ideas to yourself because it is only by sharing your ideas that this action will spawn new ideas. Those are the major action steps you must take. First, become an expert, and second, communicate your ideas often so that this will spawn new idea generation. And one corollary to becoming an expert is that it will really help if you have broad experience in your field. Try new things out. Talk to other experts in your field. Be curious. Learn as much as you can about how others are doing things in your niche. Finally, to borrow the title of a book, “Be So Good They Can’t Ignore You” (or your ideas). Build your skills, become an expert, get a wide range of experience, and you should never lack for ideas. And certainly not if you use the bonus tips below. Here are two little tricks and tips to generate even more ideas faster once you’ve taken care of your idea foundation. First, you need to identify your “Idea Magic Time” and “Idea Magic Activities”. The funny thing about great ideas is that they rarely show up when you are trying to find them. Few brilliant ideas have come to pass while we toil away at our desks. Instead, the idea often arrives like a flash of lightening when we are far away from our desks – often absent recording devices, too. But over time you’ll come to realize that your idea generation has a pattern. Perhaps it’s while you walk your dog, go for a morning run, take a leisurely bath (I’m sure at least one ETR reader still takes a bath, don’t you? ), meditate at dawn, or ruminate with a nightcap and cigar on your patio. Research has shown time and time again that getting out of our regular work areas allows our brain to work in more creative ways. That’s when ideas come. So keep an idea journal handy at all times. And when you find your Magic Idea Time, foster and protect it as ruthlessly as you do your Magic Productivity Time (the time of day where you get more work done than at any other). Finally, “Teach your subconscious to do the work,” suggests Dan Kennedy. Give it “work orders” before you go to bed each night, and over time you’ll be surprised that your brain will actually work in mysterious ways to generate ideas while you sleep. Just make sure to have that idea journal handy at your bedside so that you can record your potential million dollar breakthroughs.